I have 1.5 weeks until I learn were my site is going to be. Here’s my oh-gosh-training-is-almost-over bucket list. Polish my “elevator pitch” for the following questions…because people are liable to ask them shortly after or when I meet them. Are you married? Do you have a boyfriend? Why are you in Paraguay? 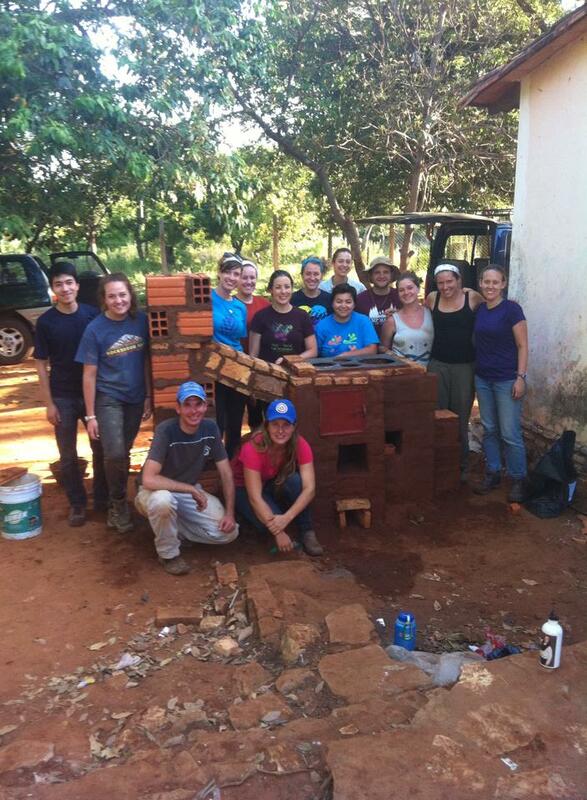 Why are you doing the Peace Corps? Identify what makes a place feel like home and think about how I might apply that to my future site. Sometime ago, I realized that I’m only as happy as I am with my home. It may seem like a minor thing for some people, but for me things tumbledown if I don’t set up a good camp. Be ready for the little things so they don’t get to me. If my site visits taught me one thing, it’s that my service is going to be filled with countless, endless, little annoyances. These will range from the same dang polka blasting from my neighbor’s house just as the roosters stop crowing to families dumping kids on me for baby sitting. Make some personal ground rules and boundaries. What kinds of things am I willing to tolerate and what kinds of things am I not willing to tolerate? Develop some strategies for child and classroom management. Children are everywhere and they are a huge part of many volunteers’ lives. I need to prepare for them to be a large part of my experience as well. Dedicate myself to learning language. Do what it takes to learn how to communicate about the daily basics—Guarani or Spanish. Look beyond the bounds of my community to round out my workload, if needed. 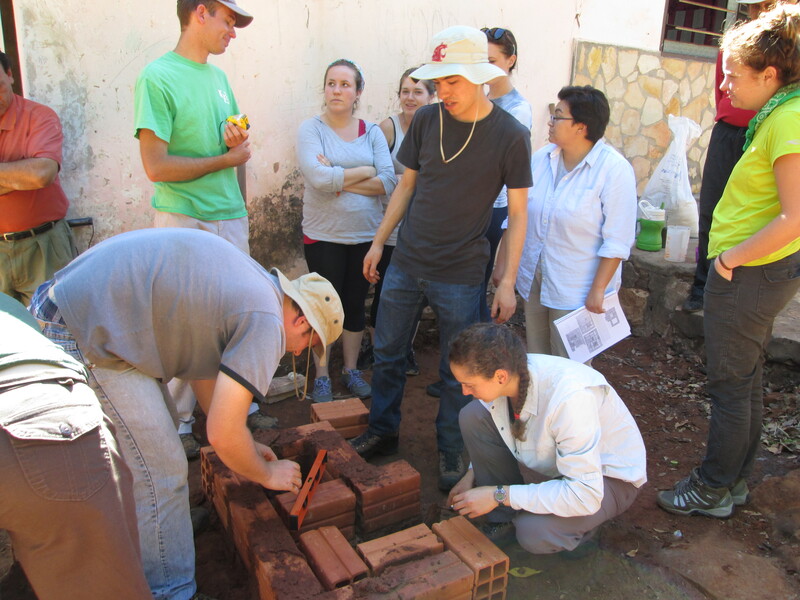 Peace Corps runs camps, committees, and other programs to achieve the Peace Corps goals. Get involved. Take it a day at a time but don’t forget the big picture. Pieces make up the whole, but if I can’t see the whole the pieces have no meaning. Think positive thoughts. I can do this. This past week I went on a second site visit. This time I traveled with 4 other trainees and 1 language teacher. We spent 3 nights in the community of a current volunteer. We had language classes at the volunteer’s house and helped the volunteer with projects like giving health presentations and making dish soap. I stayed with a host family on a humble farm with a wonderful view. The fields lightly peppered with trees, tall golden-white grass, and cows reminded me of my childhood—rural Vermont. The corrugated-ruffed space that served as a dirt-floored dining room/living room looked just right with its hanging baskets of plants, rough-wooden chairs, and flower-patterned clothed table. Somehow the attentive audience of cats and dogs who sang songs around my feet while I ate was charming. I found myself amused and pleased by the pigs that wondered in-and-out of the living space, grunting and squeaking as they waddled. The pigs were funniest when the mother of the family locked them in a shed just next to the dining table so they wouldn’t bother her while she cooked. The pigs pushed their snouts out of a hole in the bottom of the door and gave a squealing protest. I started my days early with a sunrise run with my host volunteer. Nothing quite lifts my spirits like a good morning run,. Next came my shower and coffee breakfast. I’m not usually a coffee drinker, so even the mostly milk brew was quite a kick-starter. Running water in Paraguay—showers, sinks, and toilets—are different than in the US. The simplest of shower spaces has a concrete floor with a drain with nothing separating the shower space from the toilet space. 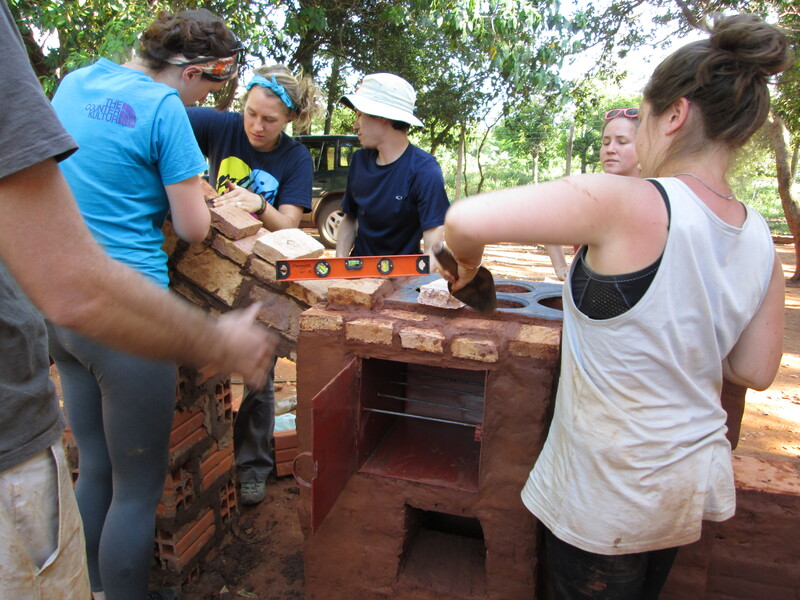 The walls of the bathroom are made of mud bricks and put together with a clay-cement-dirt mix. The showerhead is plastic and round, maybe 8 inches in diameter. There is a switch along the edge of the showerhead were you can select cold or warm water. The toilet has a string to flush it that is attached to a tank mounted on the wall about 5 feet above the floor. The sink faucets in the bathroom (and kitchen) are frequently plastic. In the morning, at the volunteer’s home, I had Guarani class. The afternoon was filled with laugher, health presentations in the 30-student community school, and chatting in a mix of English, Spanish, and Guarani: They say that volunteers leave Paraguay speaking 3 languages poorly. My group gave a dental hygiene presentation to community parents a day early because plans changed at the last minute and we redesigned our recycling presentation for kids halfway through because the activity we planned wasn’t working for the students. We made bubblegum colored dish soap and tried double digging the volunteer’s garden. I say “try” because the site I visited hasn’t seen rain for about 3 months and the soil was like a firmly packed, dirt road on a crisp Vermont-autumn day—pretty dang hard. I have almost 2 weeks before I learn where my site will be. Nothing has helped me feel as ready as the volunteer site visits. I’ve gotten to practice my language skills with community members and to see what life, as a volunteer, is really like. I spent my first site visit learning what it means to be a volunteer and confirming that the Peace Corps is right for me. This second visit, to a different site, I spent learning how I can be a volunteer once I get to my site. It’s hard to explain how helpful it’s been to have my host volunteers answer the waterfall of questions I’ve had, share their stories and insights, and show me that being a volunteer is real, not just an amazing dream. Terere is a drink that consists of yerba mate. 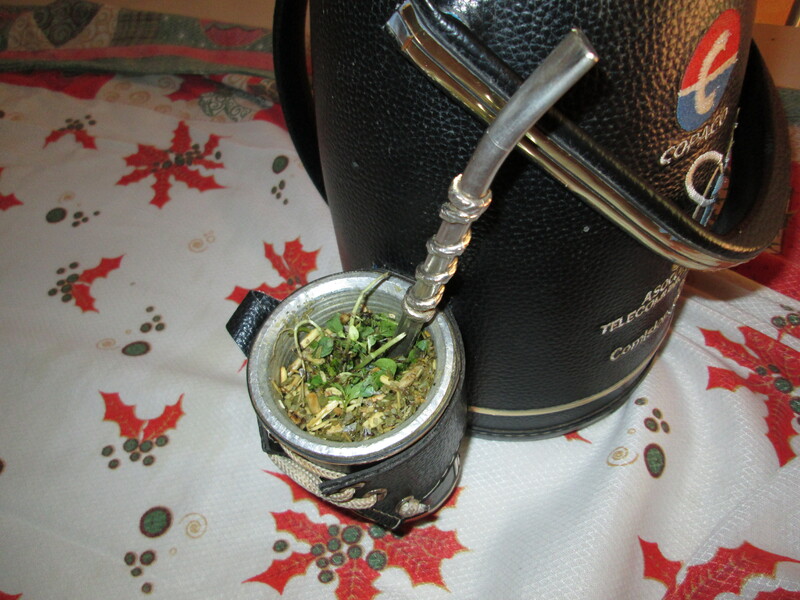 The yerba mate is dried and is often mixed with other herbs. My favorite blend has boldo and mint. 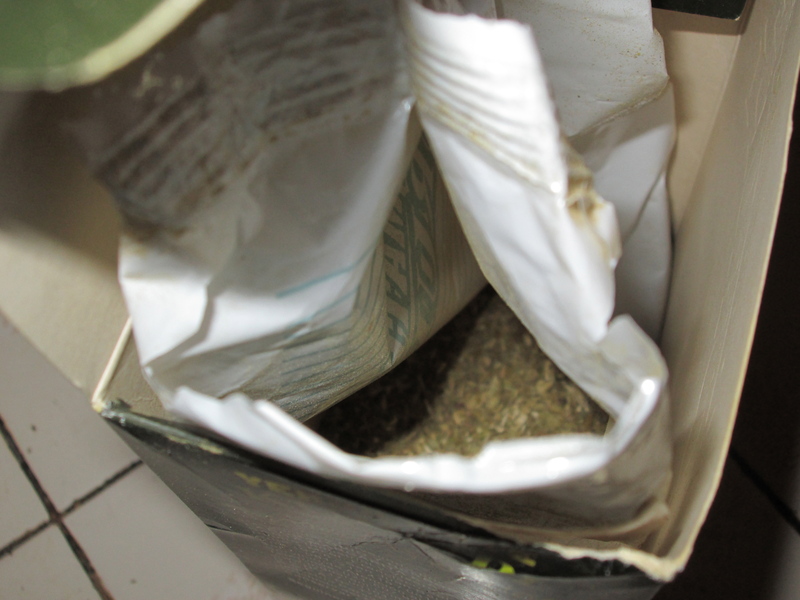 The dried herbs are poured to fill about two thirds of a cup (there’s a special cup for terere that’s called a guampa). Cold water is poured over the herb mixture. 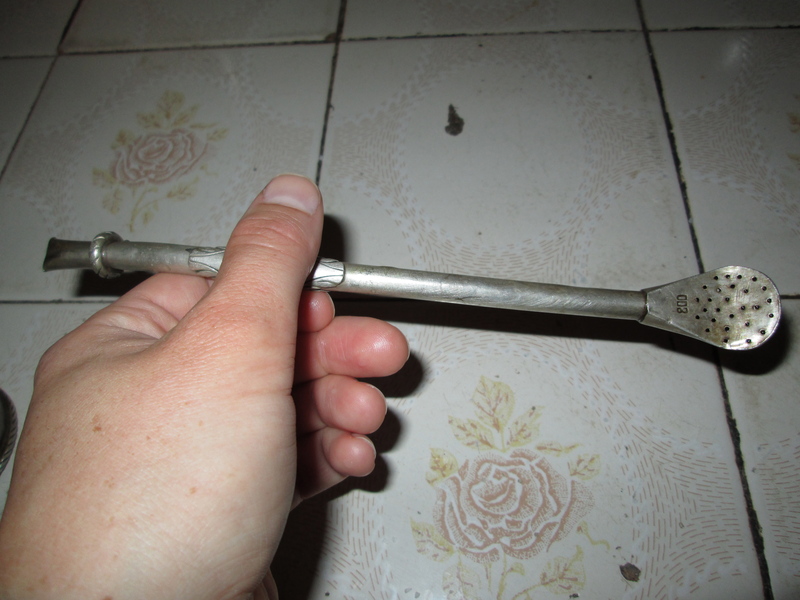 You drink terere through a medial straw called a bombilla that has something like a tea filter/strainer on the tip. You can also put fresh herbs or lemon in the water you use to pour over the herbs. Most Paraguayans drink terere, and they drink it a lot. I’d say terere is the first free-time pastime, surpassing soccer because you can drink terere while watching soccer. Drinking terere is social and can go on for hours. The first cup poured is for Saint Thomas. Why? The water is absorbed by the dry yerba mate so no living person can drink it. When serving terere you should pass to your right. The water should be poured into the cup so that it just covers the dried herbs. When you get the terere cup, you must drink all the liquid in the cup. You should finish it in 1 to 2 sips (I usually need 3). You should NOT drink terere while you are eating or smoking because the flavor gets stuck in the straw (yuck). You also should not participate in drinking terere if you are sick. It is your responsibility to say “no” if you are sick because people will still offer terere to you to be polite. You shouldn’t keep the guampa too long, so when it’s your turn to drink take a break from talking. Don’t say “thank you” when someone passes you the cup unless you want to stop drinking terere. You only say “thank you” when you are done drinking. We have them all in Paraguay and they all bite. I’m 5 weeks through 10 weeks of training. I can’t decide if a month in Paraguay is a long time or a short time. It feels like I’ve been here for years and, yet, I still don’t feel like I know what I’m doing (Example: How much are apples supposed to cost? What would I do if, in my future house, the water stopped working?). Where is my site going to be? I want to know where my site is NOW! It’s exciting to think about, but alas I won’t know where I am going to be working for the next 2 years until March 25. 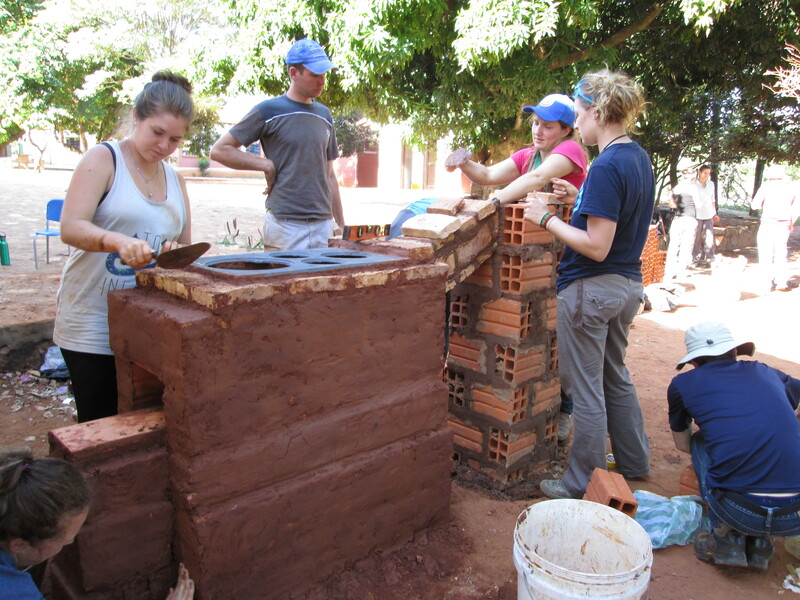 Site placement determines almost everything about one’s Peace Corps experience (drumroll). Why don’t I know (fill in the blank) in Spanish? You would think after the number of years I’ve studied Spanish I’d be fluent. Well, I do speak Spanish well enough: I just happen to have more vocabulary to discuss academic topics like government and literature than food. I guess it’s great that I can talk about character development, but I just wish I knew the names of all the veggies I want to eat. Will my host family (or families) in my site be as wonderful as my current host family? My current host family is great. I’m so happy to have them. I’ll be in site about 8 times as long as I’ll have been in training by the end. That’s a long time. Am I going to be able to make a difference? Talking about talking about health is easier than talking about health and talking about health is a hell of a lot easier than improving health. Will I be able to foster relationships strong enough to do projects once I get to site? Will people understand me when I talk? What kinds of projects will I do? If you were to look up the word “guapo” or “guapa” (the “o” ending for men and the “a” ending for women) in a Spanish dictionary you would likely find a definition like, “beautiful, cute, or physically attractive.” And, while that definition will serve you well in most places, it won’t in Paraguay. In Paraguay, guapo or guapa means hard working. It is a complement that is lightly tossed around, but I think it has a greater weight than the joking way it’s delivered may imply. If people think you’re guapa you’ll go far. Respect is given to people who work and especially those who work hard. Why? I don’t know yet, but I have some guesses. 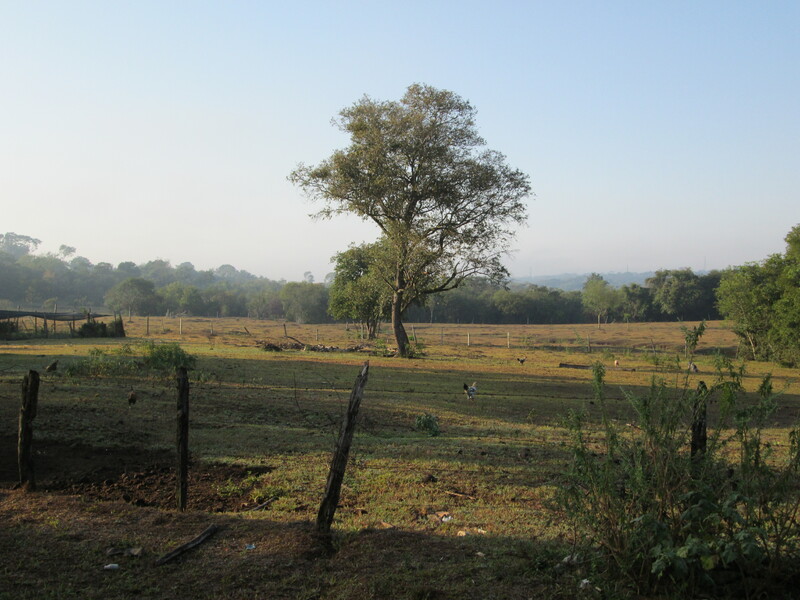 As you will hear many times, it is hot in Paraguay. Have you ever tried to do anything when it’s over 100 degrees and humid? It’s like trying to do calculus after staying up all night. You deserve brownie points for just staying awake. Things just take longer here (generally). Many people wash their clothes by hand and hang their clothes to dry. Some communities don’t have running water or modern stoves so people have to haul water, bucket bathe, and cook with a wood-burning stove. Paved roads are in the minority and newer to the scene. Paraguayan culture is laid-back. One of the main free time activities is sitting and drinking terere. A fogone is a wood-burning cook stove. It is made out of brinks and mud/cement. 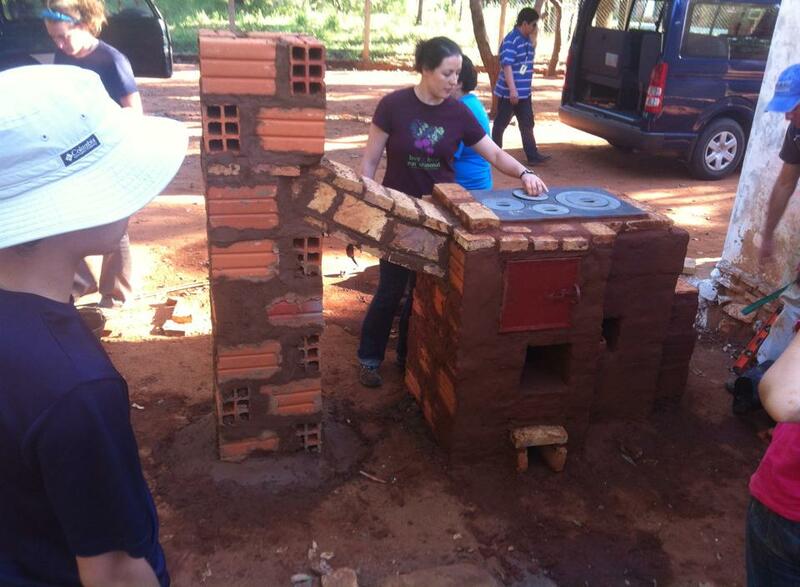 In rural areas of Paraguay some families still cook all their meals over open fires. Oftentimes these fires are under a roof or inside the house. While cooking over an open fire is just fine while you are camping, it can negatively impact health if used for all meals throughout a lifetime. 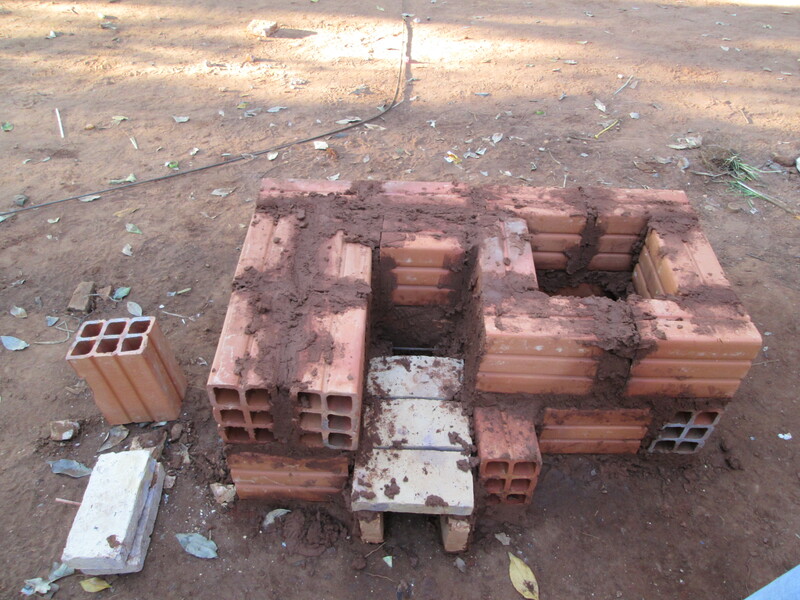 A fogone offers an economical solution for families that use wood to cook. 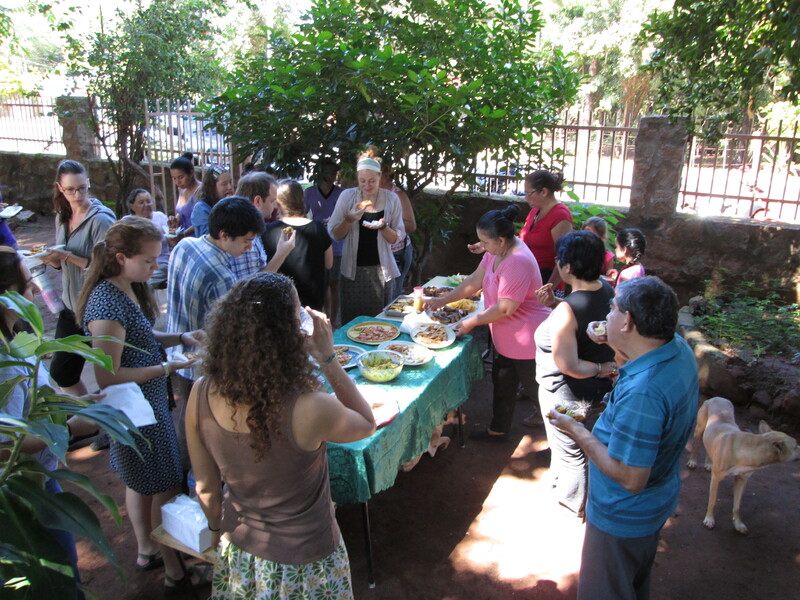 Gas is expensive and many traditional Paraguayan foods require a lot of time to cook. Wood is generally inexpensive and can be an environmentally friendly, sustainable option if the wood is harvested correctly. Building the first couple layers of the fogone. First two layers of the fogone. When I was younger my family went on vacation to Prince Edward Island, the island of Anne of Green Gables. Much like Anne’s hair, Prince Edward Island has red beaches and red dirt. 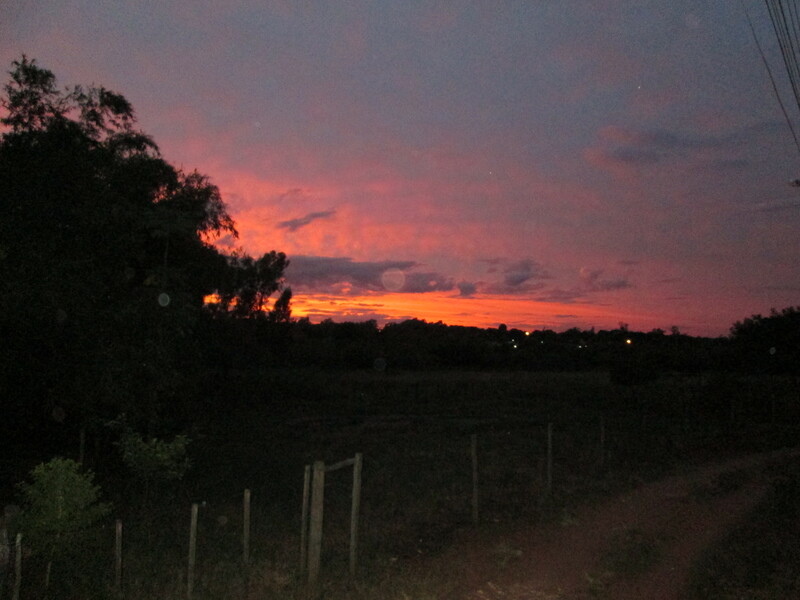 Paraguay has red dirt too. I find myself thinking of Anne of Green Gables from time-to-time–not only because of the dirt, but because the ox carts and horse carts that plod along my community’s roads and hand washing my clothes remind me of a time past. 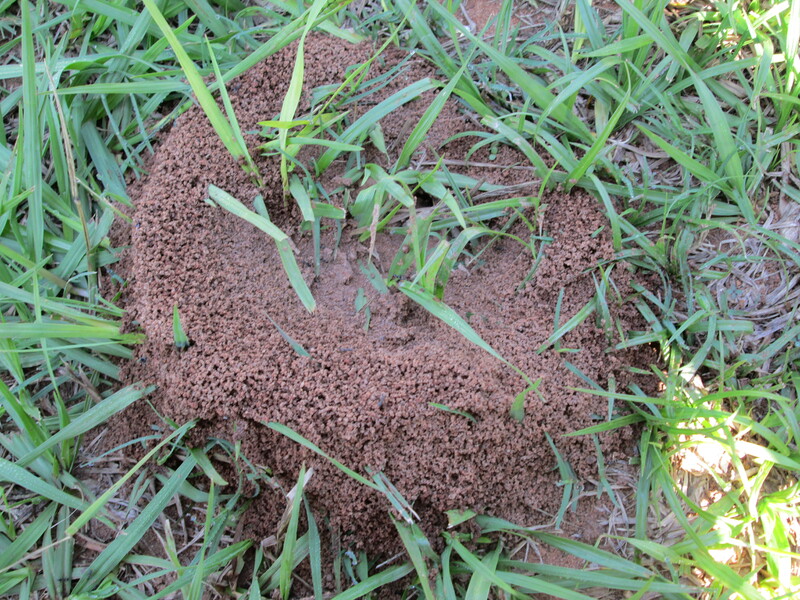 They say in the Paraguay campo (the countryside or rural areas) the red mud is worse. It can be hard to get out of your clothes and shoes. 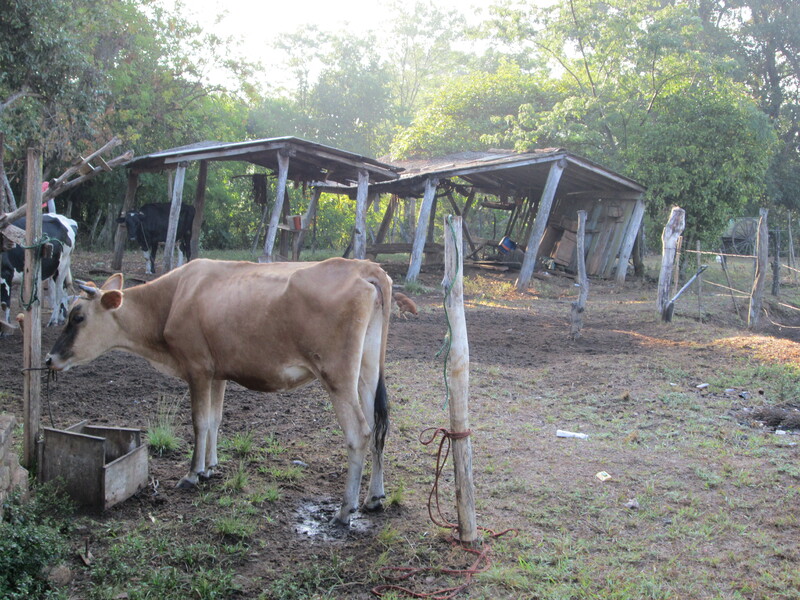 Volunteers in the campo suggest soaking red-mud stained clothes overnight to cut down on clothes scrubbing time. When it rains even the paved and cobbles streets are flooded with red-water rivers and puddles. Most of the Paraguayan dirt I’ve seen is fine sand. The sand gets everywhere—it crunches on the tile floors in my house, tracked in on our sandals, and creates a light film that covers walls and windows.